Munich - already knows what it is like to play for a leading club, but the ever-ambitious forward is always looking to improve. Moving to the Bundesliga from South Africa was "a dream come true" for the Zimbabwean striker, who on Saturday comes face to face with the some of the finest players the German game has to offer, as FC Augsburg play host Borussia Dortmund. Named as the South African Premier Soccer League’s rookie of the year in 2010 and claiming the Lesley Manyathela Golden Boot as league top scorer the following season, Musona had already earned his spurs at the top level of the African game with Kaizer Chiefs before making the bold move to join 1899 Hoffenheim in 2011. "I always dreamt of playing in Europe so a move to Germany was a dream come true,” he told bundesliga.com ahead of Saturday’s visit of Dortmund - defending Bundesliga champions, DFB Cup holders and recent conquerors of Real Madrid. Musona can relate to the likes of , and , opponents on the field at the SGL Arena this weekend. "The Kaizer Chiefs are the mother of all clubs in South Africa," he said. But having left almost guaranteed glory behind, he is now keen to make the grade at a higher level. After a year of settling in with 1899 Hoffenheim, Musona is now getting what he came for in the wake of his summer loan move to western Bavaria. "For a footballer, the aim is always to play as much as you can," he explained. "In Augsburg, I have the chance to do that and I want to pay the club back with good performances. I want to help the club avoid relegation in what is always a difficult second year in the Bundesliga. Personally, I hope to play frequently so I can improve as a player too." 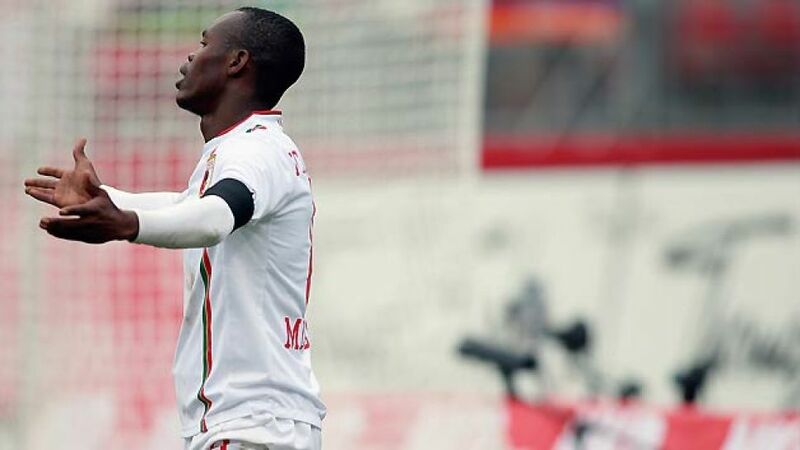 Musona may have yet to open his account in Germany's top flight, but it is certainly not for the lack of trying. His partnership with Aristide Bance has the potential of a match made in heaven, with only one crucial ingredient still lacking: goals. "I hope that the bubble will burst soon and we'll be able to keep Augsburg in the Bundesliga," said the optimistic 22-year-old. "It’s frustrating when you give everything in every game and don’t get rewarded for your efforts, but we still believe in our strength and we’re optimistic that we'll be able to leave the foot of the table with a combined team effort." Something more will be needed to see off the side who came within seconds of completing a double over Real Madrid in the UEFA Champions League on Tuesday, but Augsburg, despite having won only once all season, are not to be written off lightly. "As I said, we need to be committed, united and have that bit of luck on our side in front of goal," Musona noted. "It’s always special to play against the defending German champions and Dortmund have one of the best squads in the league, but we’re certainly not going to give up without a fight and we want to get something in front of our fantastic fans in the SGL Arena." The second year after promotion is traditionally the hardest and often ends in relegation. "I'm certain that won’t happen to us because we have a great squad," Musona insisted. "In our situation, all that matters is that we work hard so that things finally click." Between now and May, it could be a long, hard winter for Augsburg, but Musona is geared up for the challenge in his increasingly familiar surroundings. "I was warmly welcomed in both Hoffenheim and Augsburg and soon settled in," he said. “Of course everything was new to me in Germany to begin with, but I'm very happy here now, even if it does get pretty cold in the winter!" For Dortmund, the biggest challenge will be to put their midweek heroics behind them and focus on the bread and butter of the Bundesliga. "We'll be going there with plenty of respect and know what we're up against," coach Jürgen Klopp stressed. "Games are tight in the Bundesliga." And rather than dealing with Cristiano Ronaldo, their task now is to ensure Knowledge Musona does not break his Bundesliga duck in Bavaria this weekend.